There are plenty of organic rug shampoo recipes out there, so there is no need to spend a lot of money buying chemically loaded rug shampoos. Homemade rug shampoo recipes are easy enough to find, but many of them call for adding chemicals like sodium laurel sulfate, a decidedly non-organic product. So, to help you avoid the time and energy looking for even the most basic organic rug shampoo recipes, below are few recipes you can try out to see which one works best to clean your rugs. Use this fast and simple recipe to clean up small spills and spots. You'll want to use an old toothbrush and cold water. Using cold water prevents stains from setting in. Dip the toothbrush in cold water and begin working out the spot. Use a clean cloth to blot up the stain as you go. It's so simple and it works. If you've spilled something oily on your rug, sprinkle it with baking soda or cornstarch to soak up the grease. Let it sit for at least an hour and then vacuum it up. Mix these ingredients thoroughly in a spray bottle. Spray the stain and begin working it out with a brush. Blot as you go until the entire stain is gone. If the smell of ammonia and vinegar linger after you've removed the stain, simply sprinkle a little salt over the spot and let it sit for an hour, then vacuum it up. Mix thoroughly in a spray bottle for small stains or in your carpet shampooer tank for larger stains. 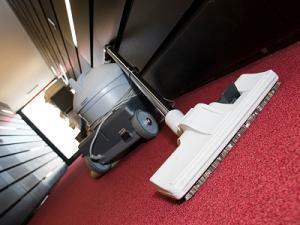 Allow the carpets to dry and then rinse the carpet with your carpet shampooer using cold water. Use this recipe to disinfect your rugs from pet accidents or if it is often walked on while people are wearing shoes. This shampoo can be used in any carpet cleaner. Mix equal parts vinegar and hot water. This amount varies depending on the size of the carpet you're cleaning and how much liquid the rug shampooers "soap" tank holds. Add five drops of tea tree, lavender, Eucalyptus or thyme essential oils per eight ounces (one cup) of liquid. Clean your carpets according to the manufacturer's instructions. Vacuum first. This gets up all the loose dirt, dander, pet hair and stuff left behind in your carpeting by your family. Sweep the carpet. It sounds weird, but using a stiff broom (like a corn straw broom) to sweep over your carpet makes the nap of the carpet stand up. This makes it easier to get at the dirt and debris that is ground down into the carpeting. Always, always do a test spot. In some cases, products like vinegar and borax will fade the color of your carpeting, so you'll want to test spot in a small area before shampooing your entire rug. Try a test spot inside a closet or in a way off corner and wait a day or so for final results. This way, if the shampoo does affect the coloring of your carpet, no one will notice. Never mix borax, ammonia or vinegar with commercial chemicals. This can lead to a chemical reaction that results in dangerous and noxious gases that will make you and your family very ill.